Russian physician; son of Samuel Fuenn; born at Wilna in 1848; died there Aug. 12, 1901. Educated at the rabbinical seminary of his native city, Fuenn taught for two years, and then studied medicine, being graduated as M.D. from the University of St. Petersburg. He settled at Wilna, and devoted his professional skill to the healing of the poor. 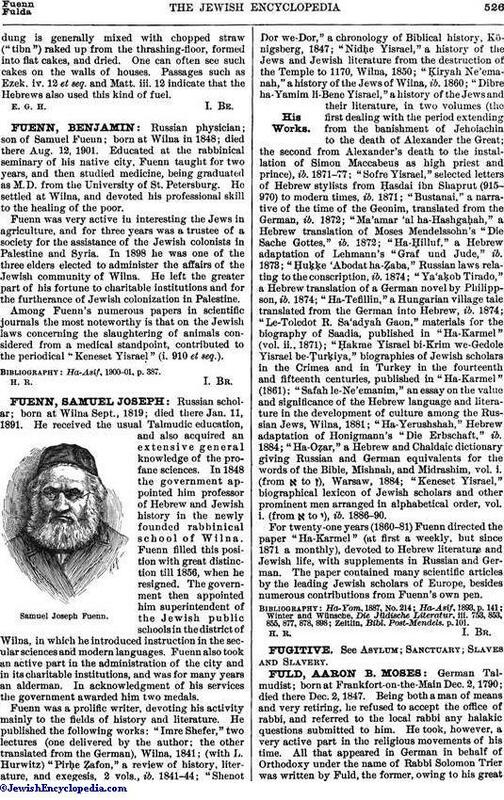 Fuenn was very active in interesting the Jews in agriculture, and for three years was a trustee of a society for the assistance of the Jewish colonists in Palestine and Syria. In 1898 he was one of the three elders elected to administer the affairs of the Jewish community of Wilna. He left the greater part of his fortune to charitable institutions and for the furtherance of Jewish colonization in Palestine. Among Fuenn's numerous papers in scientific journals the most noteworthy is that on the Jewish laws concerning the slaughtering of animals considered from a medical standpoint, contributed to the periodical "Keneset Yisrael" (i. 910 et seq. ).